Probably the most common injury suffered from car accidents is whiplash. Whiplash, a term that is often over used, can occur when a driver is rear-ended in a car accident. The body experiences un-natural motion as the lower part of the cervical spine (neck) is moved well beyond its normal range of motion. This movement puts strain and risks injury to the muscles, ligaments and discs in the neck and upper back area. Whiplash is caused when the head is literally “whipped” back and forth so quickly that it is almost unnoticeable. The quick jerk of your neck can cause damage to spinal ligaments, tendons, muscles and in some cases the spine itself. After a car accident, most people worry about the damage to their car, dealing with insurance and losing their transportation. Whiplash often goes unrecognized and untreated, especially if the sumptoms are not apparent for days or even weeks later. Failure to recognize the extent of the injury can be due to a number of causes, including adrenaline at the time of the initial shock, the pysical build and health of a person anda person’s age. 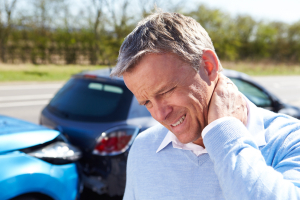 If you think you have suffered whiplash, immediately contact Dr. Amir Nadimi’s office at (203) 441-4371. Dr. Nadimi works diligently to solve your aches and pains as quickly as possible. Dr. Nadimi works with experienced medical specialists and personal injury attorneys to make this difficult process as easy as possible for you.